Blog your way to VeeamON 2019 in Miami! 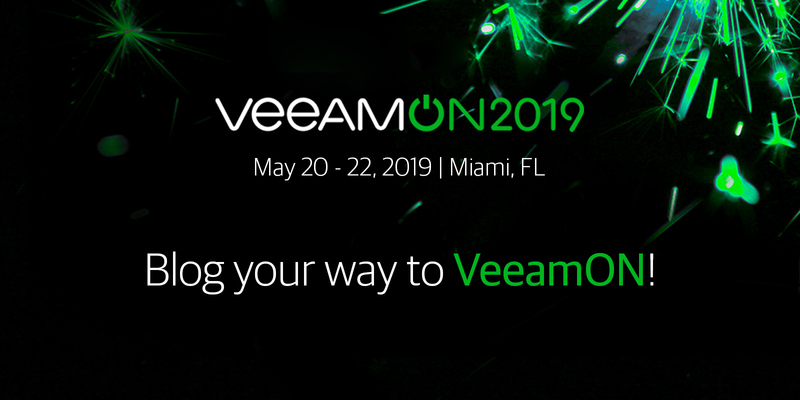 This is your chance to win three exclusive VeeamON 2019 packages that include an event pass, airfare up to $1,500 and three-nights’ accommodations in beautiful Miami! Plus, we are awarding 10 event passes to ten additional contestants. To enter the contest, come up with the most engaging and meaningful content about VeeamON 2019 until April 15 and send the link to the blog post to sponsorship@veeam.com. Read full details of the contest in the Terms and Conditions. Breakout sessions: We will have 50+ breakout sessions with various tracks on the latest industry trends and worldwide technology best practices, along with discussion panels and how-to sessions on Veeam capabilities. Industry keynote speakers: The speakers list includes Anton Gostev, Danny Allan, Jason Buffington, Michael Cade, Rick Vanover and more! Veeam Certified Engineer (VMCE) trainings are offered at a more than 50% discount only for VeeamON 2019 attendees. More information can be found here. Check out last year’s recorded sessions. Feel free to contact us with any questions at sponsorship@veeam.com.